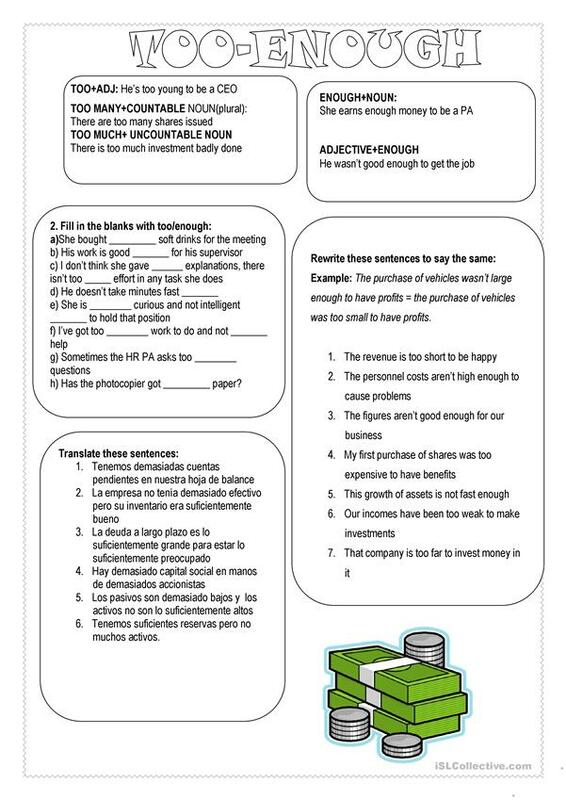 Use and explanation of the forms too, too much, too many and enought using specific vocabulary regarding financial English, English related with accounting, finance, etc. The above downloadable worksheet is best suited for business/professional students at Intermediate (B1) level. It is aimed at teaching Too and enough in English. vickycifuentes is from/lives in Spain and has been a member of iSLCollective since 2015-02-01 17:37:39. vickycifuentes last logged in on 2019-04-10 21:29:22, and has shared 11 resources on iSLCollective so far.